Nigel Pasby - Musical Director - Website of kennetaccordionorchestra! Nigel began playing the accordion at the young age of five, perhaps no surprise given his father Cyril was a renowned professional accordion teacher. Under the tuition of his father and with many hours of dedicated practice, Nigel’s skills developed and during the mid 1970s, he was awarded both Teacher and Performer Diplomas from the British College of Accordionists. 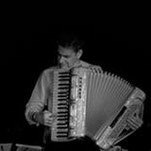 In 1984, Nigel became one of the founder members of the Kennet Accordion Orchestra and the following year established his own teaching school based in Swindon. Nigel held the post of orchestra playing leader for the next 27 years, during which time many of his students have played in the group. In 2011, Nigel took on the role of Musical Director (MD), being transferred the baton from our previous MD David Watson, who retired having led the orchestra since its formation. Nigel aims to continue the high standards on which the orchestra has been established and to further demonstrate the capabilities of instrument to a wider audience, while continually expanding our musical repertoire.